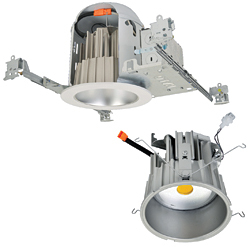 The Halo LED H7 collection features 6-inch, LED recessed downlights that include the Halo LED 900 and Halo LED 1200. The downlights deliver a color rendering index of 80 and offer a range of color temperatures — 2,700, 3,000, 3,500, and 4,000 K. The optical design yields productive beam lumens that provide smoother, more even illumination, improved cutoff, and less glare. The downlights are designed to deliver more than 70 percent of initial lumens at 50,000 hours and feature a range of dimming capabilities.